Beautiful Snowy Background by Lydia! Today I'm sharing this lovely card by Lydia! 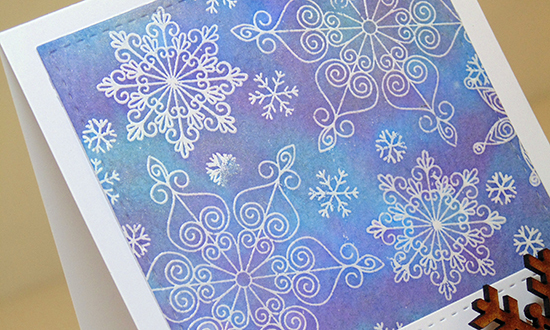 This card uses our pretty new snowflakes from the Beautiful Blizzard stamp set. She embossed those lovely flakes in white and the inked over them to create this gorgeous background! With a pretty background like that the rest of the card can be super simple. She used the "Snowy Greetings" sentiment from the Flaky Family set and added a pretty wooden snowflake embellishment with some ribbon! I love how this card is both simple and stunning! You could also easily make this into a holiday card by simply changing the sentiment! Make sure to pop back to see what our next challenge is and be inspired by our Design Team creations! Such a lovely and elegant card! Beautiful! The snowflakes are gorgeous with that background. Love all the detail! Classy and elegant! The snowflakes with the lovely sponged background...oh my!